The Pinstripe Morph is a flame or harlequin morph that has the dorso-lateral crests highlighted in cream or white. These have pin stripes running along the sides aswell as the back. Is a more exaggerated form of a tiger, with more stripes which are thinner. Bi-colour Cresties are similar to patternless cresties but the dorsal area (area down the middle of the back) is a different colour. In Bicolour cresties the colour difference isnt normally huge and there isnt any pattern on the body. Red Harlequin is a designer morph, which has been created through years of selective breeding. It is a very sort after morph and is pretty rare on the market. Also known as patternless pinstripe. This is a structural morph rather than a colour morph like the pinstripe. It is basically a pinstripe gecko where the pattern is absent but the raised pinstripe scales are present; also there is usually traces of lateral striping. The pinstripe scales are the crests that run from the neck down to the tail. The main difference between these and 'normal' crested geckos is that the dorsal crest scales are raised up and spikey rather than small rounded scales as most crested gecko have. 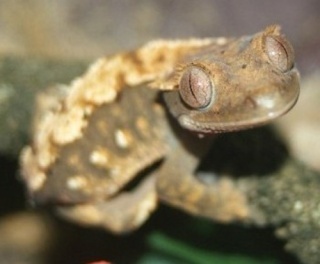 It is a newly described morph which has caused some controversy as some people do not consider it to be a morph at all. A Moonglow is a solid white gecko. Many people debate as to whether a true moonglow actually exists, because to be considered a Moonglow the gecko needs to remain white all the time not just turm white whilst its resting or fired up. Im not personally a fan of the so called moonglow geckos anyway but individual tastes are part of what makes these little animals so great. Pretty self explanatory really, this is just a solid black crestie. There is a single picture of a black crestie that has circulated the internet but its authenticity is under question as no-one has actually seen the gecko for real. And most people are in agreement that the gecko in the picture doesnt look as stunning as they expected a solid black crestie to be.